Also called "astrological sectors", there are 12 houses, just like the zodiac signs. The first house starts with the ascendant which is the point where is the eastern horizon. This is the East intersection beetween earth and sky at the precise time and place of birth. The zodiac sign pointed by the Ascendant is also called the Rising sign. Houses and signs are in analogy; the twelve houses reflect the meaning of the twelve signs. Houses are calculated according to the date and place of birth and show 12 sectors that correspond to the position of the earth. It is shaped in twelve sections of 2 hours (24h/12) and it is called a domification (latin "Domus" = house). The "ego", the physical appearance, the personality. This house gives details about the personality, the behaviour towards the outside world. 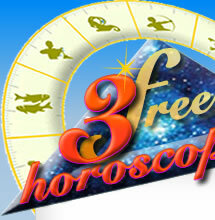 The ascendant is one of the main elements in the interpretation of the birth chart. The planets that are close to it or totally in the opposite direction are called angular, they "spice up" the personality. Money made at work, material things, belongings, presents. The neighborhood, brothers and sisters, small trips. Primary studies, communication, transportation. The family, the house, the background, the properties, childhood. Love, pleasure, creativity, relationship with children, leisure, games, contests. Daily life, work and co-workers, health, constraints, pets, small diceases. Marriage, other people, associations, real foes, trials. Crisis, transformations, death, secrets, passions, sexuality, inheritance, incomes. Travels, foreign countries, long studies, legal issues, philosophy and religion. Goals, social success, professional career, ambitions, climbing the social ladder. Just like the ascendant, the House 10 is very important. The planets that are close to it or totally in the opposite direction are called angular, they "spice up" the destiny. Friends, projects, support, protections, group activities, humanitarian causes, media. Troubles, loneliness, trials and tribulations, important diceases, spirituality, intimacy, the soul. I want to know my ascendant and my astrological houses !